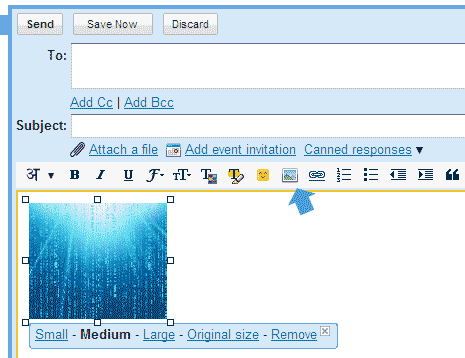 Do you want to send an email message showing inline images? In simpler terms, all full size images show up in an email message instead of small thumbnail preview or links to download attached images. Gmail has introduced new Labs feature ‘Inserting Images’ that allows you to neatly insert images in any email message in your Gmail inbox. To turn this feature ON: goto settings > Labs tab > Inserting Image option. Now while in default rich formatting mode (not plain text mode) click the image icon as in pic above. You will get a new window with options to upload image from computer or enter direct image URL. After the upload, single click on image to see controls at each corner which can be used to resize the uploaded image. Click on image will also show options bar with resize links among: small, medium, large, original size and link to remove image. With so many people sharing images via email, this should be most liked feature to insert images in email message with super ease, what say? My mail account haven’t gmail-inset inline image. May I know that’s why and what can I do to insert inline image? According to the developments in the google u are making so many developments in gmail. Congrats.